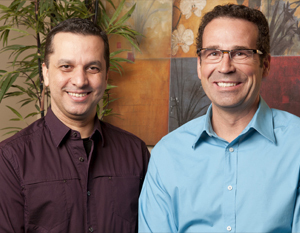 Dr. Marc Coulombe and Dr. Alaa Musbah have been the go-to dentists in Edmonton for many years. Speaking English and French allows them to communicate more efficiently with patients to ensure comfort and satisfaction. We will strive to offer excellence in dentistry with a personal approach. We have attended many continuing education courses to enhance our scope of practice in order to offer our patients many expanded services that include: implants, cosmetic smile enhancement, CEREC - one-appointment ceramic crowns and fillings, wisdom tooth removal, minor cosmetic gum surgery. By providing a variety of dental services we can offer the patient more options all in one location by the same dentist. This enhances our personal relations with our patients. Service provided in both French and English. Click on the links below to learn more about our doctors.